Highly Recommend written by mobile Still the best..
Pepper vege still the best.. Highly Recommend written by mobile Vegetarian..
Maggi cup this flavour still the best.. Received in good condition. TQ. All good.. I suka... I love..
stated above if over rm50 is free shipping. how can i get the free shipping? Dear customer, we are unable to advise regarding shipping fee. 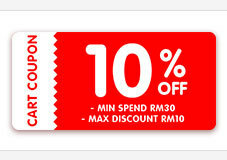 Kindly refer to Qoo10 customer care for more information. Thank You.